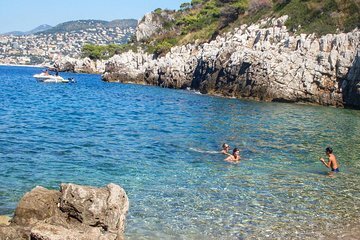 Kørsel langs kystvejen langs den franske riviera giver en fantastisk udsigt over Côte d'Azur. På denne scooter tour, undslippe trafikken og føler havbrisen i dit ansigt, som du zip langs kysten, stopper ved utrolige udsigter, smukke strande og historiske badebyer. If you really want to experience Nice and its surrounding areas and see places you wouldn't normally see, book a scooter tour with Samuel. We booked a 3 hour scooter tour and drove all around Nice. We visited places we wouldn't have and really saw and experienced this beautiful area of the world. Samuel is very flexible and is intent on making sure you have a fabulous time. It was the best activity we did in our 4 days in Nice.